It wouldn't be St. Patrick's Day without some traditional food, and of course, a pint of Guinness. "Early Show" contributor Katie Lee shared her take on the Irish classic dinner, shepherd's pie. 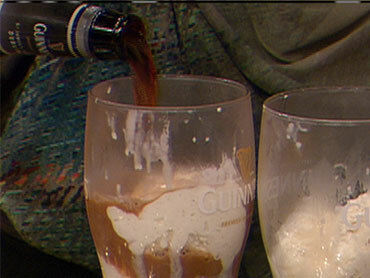 And for dessert, she's took Ireland's favorite beer to the next level with Guinness floats. Heat 1 tablespoon oil in a large skillet over medium high heat. Add the lamb and use a wooden spoon to break up the meat as it browns, season with salt and pepper. Transfer browned lamb to a paper towel lined dish to drain. Wipe skillet clean. Heat remaining oil in skillet over medium heat. Add the onion, garlic, celery, carrots and thyme. Cook until the onions are translucent and vegetables are tender, about 10 to 12 minutes. Return the lamb to the skillet and stir in the tomato paste. Add flour. Cook about 2 minutes. Pour in the stock and bring to a boil. Reduce heat to a simmer and let cook until the sauce begins to thicken. Stir in the corn and peas. Transfer to a casserole dish and spread mashed potatoes on top. Use a fork to create swirls on top. Brush with heavy cream. Bake 20 minutes. Let rest 10 minutes before serving. Place potatoes in a medium pot. Cover with cold water and add 1 teaspoon salt. Bring the water to a boil over medium-high heat. Lower heat to a simmer and cook until potatoes are fork tender, about 20 minutes. Drain. In the meantime, heat milk and butter in a small saucepan over medium heat until butter is melted and milk is very hot but not simmering. Return the potatoes to the pot and add the hot milk mixture and 2 teaspoons salt. Using a handheld electric mixer, whip the potatoes until smooth and creamy with no lumps. Adjust seasoning to taste. Preheat oven to 450°F. Grease a baking sheet. Sprinkle a work surface with flour, coat your palms, and rub some on a rolling pin. Turn out the dough onto the work surface. Knead the dough for 1 to 2 minutes, folding it over onto itself each time. Roll the dough to about 1/2 inch thick. Flour a 3-inch fluted biscuit cutter (or the rim of a glass) and cut out the biscuits. Reshape the leftover dough into a ball, roll it out again, and cut out more biscuits until there is no dough remaining. Place the biscuits on the baking sheet and brush with cream. Bake for 10 to 12 minutes, until the tops are golden brown. While the biscuits are still hot, spread some softened butter on top of each one and let it melt.